My garden is producing an abundance of summer squash, although it’s starting to slow down. I’m still looking for different ways to use them up, such as in my Double Chocolate Squash Muffins recipe. Squash and Zucchini work well in breads because they add a good amount of moisture to them. 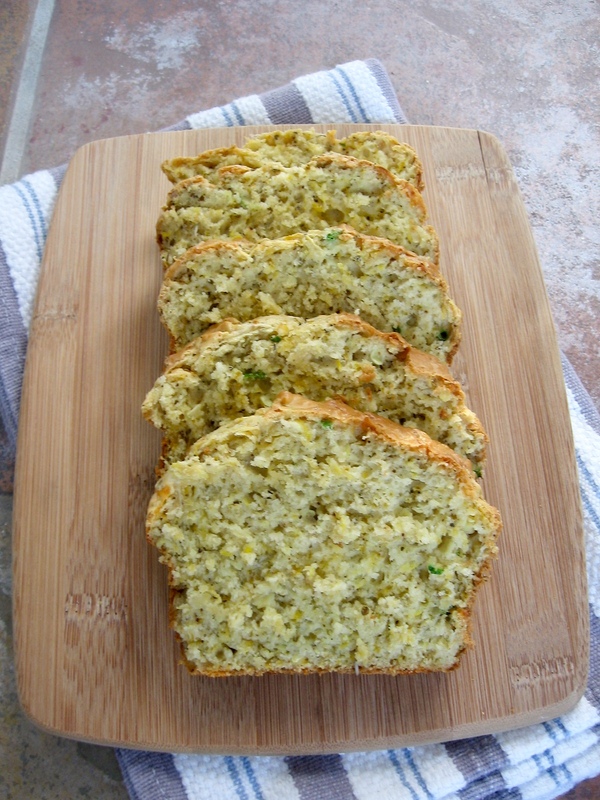 I was excited to find a Zucchini Cheese Bread recipe in an old magazine that I’ve adapted here for summer squash. I still don’t understand why so many people bake with zucchini, but not summer squash?? It really baffles me. Step 1: Combine dry ingredients, herbs, green onions and cheddar mixing well. Step 2: In separate bowl, beat eggs then add oil and milk. Step 3: Squeeze excess moisture out of squash then add to liquid mixture. Step 5: Pour batter into greased loaf pan and bake at 350 for 45 minutes or until knife inserted in the center comes out clean. Combine dry ingredients, herbs, green onions and cheddar mixing well. In separate bowl, beat eggs then add oil and milk. Squeeze excess moisture out of squash then add to liquid mixture. Pour batter into greased loaf pan and bake at 350 for 45 minutes or until knife inserted in the center comes out clean. Hello, I'm about to make your Herb & Cheddar Squash Bread as I have an abundance of squash and zucchini ready but was wondering about the green onions. I didn't grow green onion this year and was wondering if I left this out would it affect the flavor a great deal? Or could I use onion powder? Or should I make a trip to the grocery to get green onion if it is that significant. Thanks. You can leave out the onion. No problem. This was delicious! Even my picky teenager loved this bread.Thanks. It may not work out as well since it would have more moisture in it, but you could try! I made this today and it was a hit!!! I used thyme instead of rosemary and chives instead of green onions because that's what we have growing. It was still great! Looking forward to trying this today. I do have a question about the added herbs though. One tablespoon of fresh herbs is equivalent to 1 teaspoon of dried herb. Have you tried this recipe with 2 Tablespoons of fresh herb? I wonder if that would be over powering. I just got through making the batter for this. Followed directions, have been cooking for years and know how to follow a recipe, and there was so little liquid all the flour wouldn't mix up??? Naturally I added a little more milk. Checked 3 times to make sure everything was in it. Hope it turns out. BTW, I didn't put so much milk to make it runny as I have made sweet squash breads several times. Not sure, but I bet it would be fine. I just made this bread with lovely results. The batter reminded me of the texture of biscuits and after tasting the bread I think that this recipe would work well for making biscuits. Of course the oven time would be much less- a plus in my book! Thank you for this recipe!